Prestashop Maintenance Mode : Need to implement some necessary changes to your store and do not want your customers to see this at the same time, then Prestashop Maintenance Mode can be your best bet. With this module, you can add a customizable maintenance page to your store displaying a message to the customers that your store is currently under construction and will be activated soon. As Google crawls the site time to time, adding an under construction page while updating your store won't let your search engine rankings fall. Add a customizable maintenance page to your store and let the customers know that your store is currently under maintenance. Configure the text to be displayed on the maintenance page. Display newsletter subscription form on maintenance page. Multiple page layouts for maintenance mode to choose from. Option to add a customized background image on the maintenance page. A countdown timer to display the exact date and time after which the shop gets activated. Multiple countdown timer layouts for the maintenance page. Add social icons on the maintenance page. 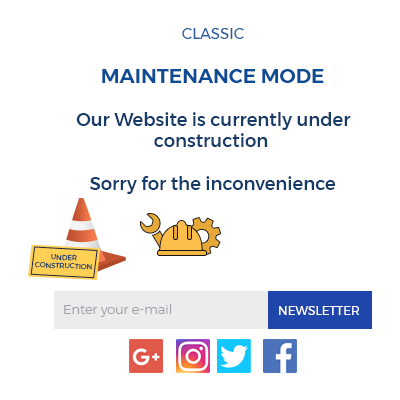 Whether you are updating a theme or layout of your store, adding new images or videos, or doing any other modifications, you do not want your customers to view an under maintenance site. 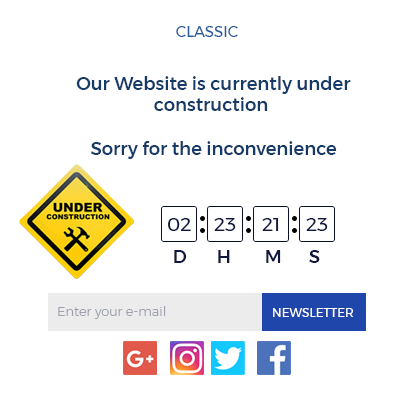 So, let your customers know that your store is currently under construction by adding a customizable maintenance page to your store. Customize your maintenance page by selecting a suitable layout and make it look attractive on the front end. You can also add a personalized background image for the maintenance page as per your convenience. Add a countdown timer on a maintenance mode page and let your customers know when you will be back online. Set the exact date and time after which the store gets activated. Multiple layouts for countdown timer to choose from. Did you buy Prestashop Maintenance Mode?